The Bee Line Truck Frame Machine and Press system is a chassis and suspension correction system for heavy duty vehicles of all types. It is widely considered to be the most accurate and efficient system available on the market today, with unlimited possibilities of configuration and installation to fit your shop’s needs. The Bee Line extra heavy duty frame machine is designed to fit into your shop and help increase production and correct all chassis to better than new. The runways easily adjust from 39" to 94" tread width. The Bee Line frame machine has the ability to handle all sizes of trucks, buses, trailers and even specialized equipment. Bee Line's design makes corrections without causing additional damage to the vehicle and without heat. The vehicle retains its original tensile strength. With frame correction capabilities in your own shop, you no longer have to rely on outside sources to work the job into their schedule. You can perform the job quickly and cost effectively with reduced downtime. Our Frame Presses come in a variety of sizes and models — including drive through, floor, pit and portable — to diagnose and correct conditions that include side sway, sag, twist and diamond. • Standard Truck Frame Press — Works in conjunction with Advanced Aligner Runways. • “I” Beam System — Constructed using I-beams mounted securely in the floor. • Drive-Over Frame Press — Completely portable press that saves shop space. • Dump Body Tools — Reshapes damaged dump bodies quickly, safely and easily. As a company, Bee Line leads the Truck Frame Correction Industry with our vast experience in equipment manufacturing, safety, training, backup service and profit potential. 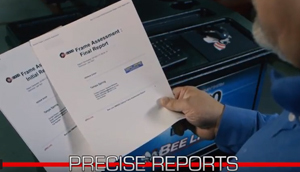 Check out a short overview of this NEW system that optically diagnoses frame damage.